AMHERST, N.Y. – As a major initiative in fostering a healthy college environment, Daemen College has implemented a new tobacco-free policy, effective Sept. 6, 2016. 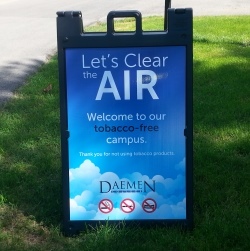 Under the policy, tobacco use is prohibited in all Daemen buildings, facilities, and grounds on the college’s Main Street campus and other college properties, including the Academic and Wellness Center, and Daemen House, the presidential residence, as well as in college vehicles. The policy covers all types of tobacco and tobacco products, including e-cigarettes. Daemen will provide assistance and smoking cessation resources and information to those who wish to quit smoking or end tobacco usage. The decision to implement Daemen’s new tobacco-free policy follows extensive research, feedback, and discussions by the college’s Tobacco-Free Task Force, which was co-chaired by Dr. Greg Nayor, vice president for student affairs, and Kelly Pogore, associate director of human resources.